Hard to believe it's been 5 years since I walked down the aisle. When I was younger I never wanted to waste my time on something as impractical as marriage but I guess I just had to grow up to it. The way I see it, it's a decision for life and I didn't want to do it only "because a woman in her 30s is supposed to have a husband of some sort, otherwise it's ODD". I spent every day of my life enjoying myself and I don't regret a single moment. For the 5th anniversary we hoped to visit an interesting hill, something with WOW factor. Saturday the 25th looked a bit gloomy but Sunday gave us a better opportunity, so we planned a celebratory trip to Glen Coe. We both agreed that our marriage needed a special blessing from The Good Shepherd from Glen Etive. Buachaille Etive Mor. The very name gives me shivers. The Shepherd is not the most difficult Munro and certainly not the most inaccessible one, but if you have seen it once, it will bugger your mind until you climb it. The very symbol of Scottish mountains, the goddess of Glen Coe. Our route was the traditional two Munros circuit, ascending via Coire na Tulaich to Stob Dearg and then following the ridge to Stob na Broige. The car park in Altnafeadh was full to bursting when we arrived (it's over 2 hours drive down from Inverness and we encountered some roadworks on A82) so we parked by Cnoc nam Bocan. That looks like a stairway to the summit! It may look daunting but the path is visible all the way and it's nothing more than hopping from rock to rock. Great fun! Kevin was just as happy as me, and full of energy. His hayfever season is definitely over and he's recently improved his fitness. I struggled to keep up with him! Hey! Somebody's nicked Ben Nevis!!! That's the summit! Busy, just as we expected on summer Sunday! The top of Stob Dearg. Loads of words have already been written about how fantastic viewpoint it is, so I'll simply share some of the splendid views and hope you enjoy them just as we did Definitely the Good Shepherd gave us a blessing! ...and so was the one we came from! We were so, so lucky with the summit views! Sure, the Shepherd's blessing was upon us! Buachaille Etive Beag. Mmmm this narrow ridge looks interesting... Another target for another good day! Here, we saw Loch Etive. I must admit, I don't know much about this part of Scotland. Apart from Bidean nam Bian and its neighbour I haven't climbed any hills in this area... But I am going to! ...but then... suddenly... a miracle happened! We wanted to spend some more time on the second Munro top, but the wee black beasts simply wouldn't leave us alone, so we quickly started our walk back to Stob Coire Altruim. We had such a fantastic day, and I wasn't even too tired, felt like I could do another hill if there was time Was it the blessing of the Shepherd working on me??? We followed the excellent, recently upgraded path all the way back to the car park. It only took us 6.5 hours to complete the traverse and that including breaks for photos, sandwiches and watching the raven Thank you, Good Shepherd, for giving us a lovely day, thank you for blessing our marriage. We shall return to Glencoe when opportunity arises. Meow! Great photos as usual, and another interesting story...happy 5th guys. Lovely - just spent my 2nd year anniversary with my wife yesterday but that was more an EatHighlands than anything that could feature on here. Happy anniversary! We spent our 8th anniversary on Ben Lawers but that looks even better. 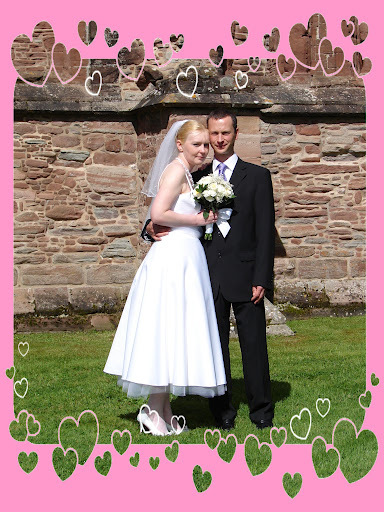 Congratulations both on five years of marriage - and may you go on to climb many more hills together! I guess some mountains are just meant for special times - glad the gods looked down on you. It was a happy day for us and hopefully many, many more of these are still to come. Happy anniversary! This is a cracking way to celebrate an anniversary.....or any other day for that matter. We celebrated our 7th in July..... and I celebrated by doing a couple of Mamores with my mate Robin!